Mobile World Congress in Barcelona has already given us two of the biggest and most eagerly anticipated phones of the year - the Samsung Galaxy S6 and the HTC One M9. A year ago, if we told you that Samsung had just announced a device that could battle with the HTC One for the prize of best designed Android phone we very much doubt you'd have believed us. The Galaxy S5 and HTC One M8 were polar opposites in terms of build quality, one a beautifully crafted jewel and the other a middling mixture of odd textures and faux metal. But, a year is a long time in the tech world and the story is very different this time around. While the HTC One M9 sticks to the same blueprint as its predecessor, with a curved metal back, premium finish and a lovely in hand feel, Samsung has completely ditched the plastic the made the S5. Instead, the Korean company has sandwiched a metal rim between two sheets of sturdy Gorilla Glass 4. There's nothing faux here. But, with this move to a new design style, some things have been lost along the way for the latest Samsung flagship. Say goodbye to the removable battery, the MicroSD card slot and the IP67 waterproof rating. 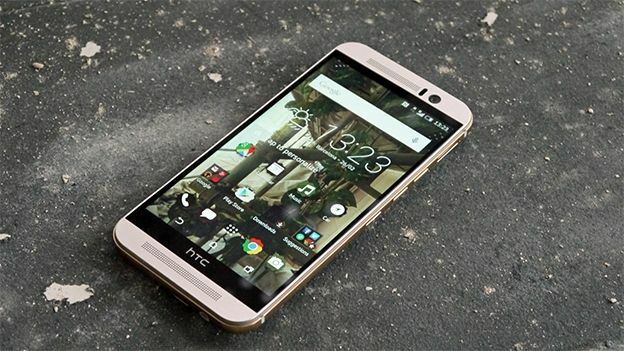 HTC has kept the MicroSD slot in the One M9, which can increase the standard 32GB of internal storage. Neither the Samsung Galaxy S6 or the HTC One M9 have seen a massive boost in screen size this year, with each packing a 5.1 and 5-inch display respectively. But that's far from the whole story. That LCD display which sits on the HTC One M9 is pretty much the same as last year. So, a resolution of 1080p, fantastic colour reproduction, great contrast and plenty of detail. Samsung though has gone one further, kitting the Galaxy S6 out with a QHD Super AMOLED display that packs a whopping 577 ppi, easily outmuscling the 441 achieved my the One M9. Unlike last year, where both the Galaxy S5 and One M8 sported the same Qualcomm Snapdragon 801 processor, this iteration sees both taking a different route. HTC has stuck with Qualcomm, using the Snapdragon 810 as the heart of the M9. The speedy processor has been paired with 3GB of RAM to create a device that we assume will chew through tasks and handle multitasking with ease. Samsung though has ditched Qualcomm, instead using an Exynos processor that it has built itself. We don't know that much about this eight-core chip yet, but it's paired with 3GB of RAM and through our initial impressions it seems to be rather speedy. With all this power packed into these phones, it's more important than ever to have a battery that goes the distance. HTC seems to understand this, boosting the 2,600 mAh battery from last year to a 2,840 mAh version. A nice and warranted jump, we must say. Things aren't looking quite so rosy for Samsung though, as the battery capacity for the S6 is actually less than the S5 and One M9, coming in at just 2,550 mAh. When you consider that this smaller battery has to run a much more powerful QHD display, that number becomes a little worrying. But, until we really put these phones through a full review we can't really say which will be the best for needing as much battery as possible. The biggest camera news here is that HTC has finally ditched Ultrapixels, on the back anyway, and instead stuck a 20MP shooter on the HTC One M9. In terms of specs, that's higher than 16MP sensor Samsung has used on the S6. Both can shoot 4K video and in a world where selfies are a real thing, both pack impressive front facing shooters. The HTC One M9 has the same 4 Ultrapixel sensor that graced the M8 on the front, while the S6 boasts a 5MP snapper. Not surprisingly, both these phones come running the latest version of Android Lollipop. Though, Google's operating system couldn't be more different on each. Samsung's Galaxy S6 comes with the often derided TouchWiz skin, though it's been flattened, smoothed out and slimmed down. It's not a complete overhaul, but it's much lighter than we've seen before. HTC's latest version of Sense, Sense Seven, also looks fairly similar to what came before it, but it does have a few nifty additions. It'll automatically alter theme (so fonts, colours, icons etc) when you switch wallpapers and it'll put recommended apps front and centre depending on your location. Software aside, Samsung wins with out the extra features. There's an improved fingerprint reader tucked into the home button and a heart rate monitor next to the camera on the back, which can also be used as a shutter button when taking snaps. We're very excited to get more hands on time with both these flagship devices and we're sure they're going to be some of the phones to beat this year. While HTC has stuck to what it knows, Samsung has looked to offer something completely different with the S6 and we're very happy about it. Specs vs style may still be applicable here, but the style section is now a lot closer.